A handwritten Burroughs letter turned up on eBay a few weeks ago. If I remember correctly the letter was from the mid-1990s and in it, Burroughs expresses his thanks for a $5000 loan. I traded a few emails with Burroughs fans who were surprised that Burroughs was hurting for cash at such a late date. The publication of Naked Lunch and the resulting royalties, particularly from Grove, allowed Burroughs to end his dependence on his parents’ generosity, but this independence did not happen until the 1960s. In 1984, Burroughs signed a $200,000 book deal with Viking, coupled with a 45,000 pound deal for the British rights. At the time, Burroughs had mounting debts (some stemming from his son’s medical expenses), and this deal provided some measure of financial security. As Burroughs became more of a mainstream figure, his financial prospects must have brightened even more. But it is my understanding that Burroughs always struggled with money problems of some type. As one of my email correspondents pointed out, Burroughs needed a collaborator in his financial life as well as his creative one. Without a doubt, James Grauerholz provided creative, personal, and economic stability to Burroughs’ life. Yet financial concerns dogged Burroughs to the end of his life. Burroughs was never the millionaire that Kerouac portrayed Burroughs to be in books and letters. This myth dies hard even today. The early 1970s was another era of a global recession directly tied to the state of the oil market. In 1973, Burroughs lived in London and he was looking for a way out. In desperation he dug into his voluminous archives. 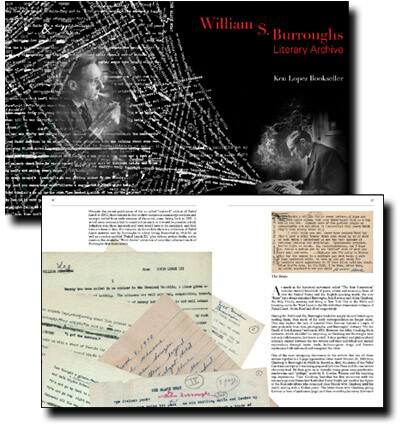 In detailing the Burroughs archive offered for sale by Ken Lopez, I told the story of how Burroughs mortgaged his literary history in order to finance his return to the United States. The archive was sent into private hands and remained under lock and key for decades. That is until the recent sale of the privately held archive to the NYPL. The repercussions on Burroughs criticism were and are immense. Who knows what would have happened to Burroughs’ archives under different personal and global economic circumstances? Yet the benefits to Burroughs personally were even more important. The sale allowed Burroughs to return to the United States and begin the second stage of his creative life that culminated in the trilogy of Cities of the Red Night, Place of Dead Roads, and Western Lands. This letter with its insight into the struggles of supporting oneself as a writer or artist in the United States, even for a writer as well-known and seemingly successful as Burroughs, got me thinking about the current state of the economy and what it means for the rare book business and the health of the Burroughs / Beat market. I am not alone. So what does today’s economic market mean for the rare book business? In a recent blog, Brian Cassidy commented that more customers are coming into his store selling books. Rare book bloggers are addressing the affects of a down market on the book trade? Are we going to see an increase in the availability of rare books due to the economic downturn? Do writers and collectors generally sell their literary treasures in tough times, like Burroughs did in 1973? ? In real estate, one always hears that a recession is a buyer’s market. Is a recession the perfect time for a book collector, bookseller, or institution to acquire interesting material? Are rare books good investments? (For conflicting views see David Brass Rare Books or MyFineBooks.) Personally, I remember tons of Burroughs and Beat material being available in the dot.com boom years of the late 1990s. (William Reese on the rare book market in 2000.) Is this a myth like the legend of Burroughs’ trust fund? Does a robust economy directly relationial to a wide selection of great material? Or is this yet another faulty memory? Are there any economic laws relating to book collecting? How does the rare book market reflect on the overall economy? In an effort to answer some of these questions, I interviewed a bookseller (Brian Cassidy), a book collector (Ted Dunn), and an economist (Peter Leeson) about the economics of the rare book industry. Written by Jed Birmingham and published by RealityStudio on 30 June 2008. This article in the Washington Post reinforces much of the thoughts on collectibles not being a solid investment. Replace ‘my guitar’ with ‘my books’ and that’s where I stand.